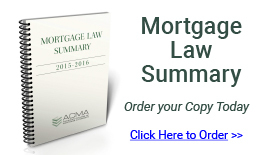 Formed in 1974, the American College of Mortgage Attorneys (ACMA) is comprised of more than 400 lawyers in North America who are experts in mortgage law. Our Fellows share a commitment to giving back to their profession, improving and reforming laws and procedures affecting real estate secured transactions, and raising the level of professionalism of lawyers practicing in this area. Fellows have distinguished themselves as practitioners in the field of real estate mortgage law through their skills and practice experience, bar association activities, lecturing, authoring articles and program materials, participation in the legislative process, and writing briefs and/or arguing cases that are significant to mortgage transactions.